Today, the student community have moved to digital spaces, and expect information, that can be made available beyond the conventional route. 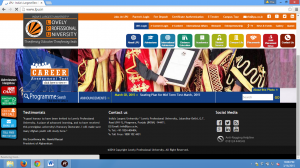 A website is their first touch point to initiate further interaction with an institute. An increasing number of colleges and universities have started acknowledging the need for a sophisticated website, that can reach out to the brightest minds, in an easy yet a rewarding way. In fact, one of the key findings in the Trends in Higher Education, Marketing, Recruitment and Technology report published by Hanover Research in March 2014 states that Among the most important tools for social and online marketing is an effective and intuitive website, which should be considered the “ultimate brand statement” for an institution. In order to create a competent and best-in-class higher education website, the following four website design trends are projected to play a crucial role in the year 2015. We will also have a look at our very own and internally nurtured institutes, which have successfully adopted these trends. The web is being surfed on multiple devices, each with different screen sizes, requiring a different display size and content layout. With Google announcing algorithm changes to generate responsive results wef April 2015, each page search now will be assessed on how mobile friendly a website is. It is only imperative that the educational websites now focus primarily on Responsive Web Design (RWD), that is, to be accessible effortlessly across desktops, mobiles, tablets, TVs, phablets or any other web based device. 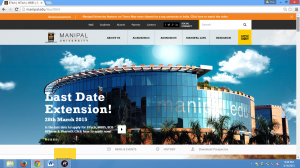 Manipal University (www.manipal.edu) has an excellent cross-platform adaptability that comforts every single visitor to gather sufficient information on their handheld devices. Campus tours, are of course, one way to take the students through the look and feel of the institutions. But these days, students are rather more interested in a virtual tour, and save time to enhance their productivity. A website, that offers, factual knowledge along with a visual and engating presentation can help a potential candidate in a quicker decision making. 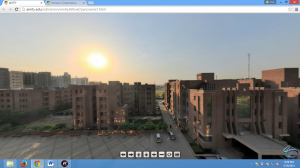 AMITY university is a fine exponent of a ‘show and tell’ website (www.amity.edu). 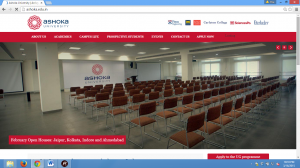 It boasts of 360 degree virtual campus tour, video gallery and photo gallery, creating a sensory experience in the mind of the prospect and ensuring a maximum optimal conversion rate. An enviable website design essentially may not guarantee the increased footfall from the target audience. But the one with a powerful content and widespread presence across various virtual podiums can bridge the said gap. Social media platforms like facebook, twitter and pinterest have been instrumental for the institutes in reaching a farther and wider target base. This further results in an easy flow of communication and dissemination of information, attracting more students to visit the website. The website www.lpu.in of Lovely Professional University (LPU) is present on every electronic platform, that has even a slightest possibility of garnering the attention of prospective students. It provides an easy accessibility to its knowledge centre through all major social media networks, live chat, whatsapp, a toll free number and a call back number. A website should not only render information, but also enable the ease of use and constructed information flow. No matter how grandiose or flamboyant a website may be, the first thing that future students look for is the information. The navigation bars, sliders or ‘call to action’ tabs are a few elements to highlight the primary content of the website. Frequent site testings and Google analytics tools, would give you a fair idea on how easy your website is to navigate and what changes are required. A classic example to cite here would be the website of Ashoka University. www.ashoka.edu.in. It has such compatible webpages that serve the exact purpose with a relative ease. 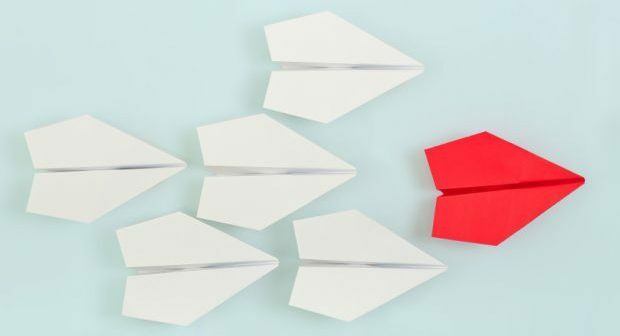 The advance technology in higher education sector is evolving at a phenomenal speed, aligning the needs of prospective candidates to the goals of an institute. There are more trends on the horizon, but all of them aim to foster a better experience for the users. Ultimately, what matters is to build an intuitive website that can capture the students’ demands effectively and respond to their search queries promptly. Disclaimer: Images shown above are Intellactual Property of respective institutions.